"My whipped cream is running :( not able to decorate my cake. I tried cold bowls ... read full review"
Whipping cream can be used for several purposes. A common use is for making a whipped topping for cakes, pies and other desserts. It is also used as an ingredient in recipes for desserts, soups, sauces and beverages. To make whipped toppings, heavy cream is whipped, using a whisk, hand-mixer or stand mixer. The mixing process creates air bubbles in the cream and as the cream is whipped the fat is distributed among the air bubbles, which causes them to stick together and create foam. The fat particles must be cold for them to stick together. The amount of butterfat contained in the cream will determine how well cream will whip and how stable it will be. See the chart below for some of the different types of cream you will find available. Half and Half Cream 10 1/2 to 12% Not used for whipping. Generally used in beverages. Single Cream 20% Not used for whipping. Used in both sweet and savory dishes. Light Cream 18 to 30% Will whip if it contains 30% butterfat but will not be very stable. Generally contains only 20% butterfat. Whipping Cream 30% Does not whip as well as heavy cream but works well for toppings and fillings. Heavy Whipping Cream 36 to 40% Whips up well and holds its shape. Doubles in volume when whipped. Double Cream 48% Whips up very quickly and is easy to overwhip. Also used in custard, pies and sauces. Clotted Cream 55 to 60% Does not need whipping, use as is. Found in specialty food stores. Pasteurized and Ultra-pasteurized: Creams will generally be labeled pasteurized or ultra-pasteurized. Ultra-pasteurized creams will remain fresh longer but pasteurized will provide a better flavor, will whip up fluffier, and will hold up longer. If pasteurized cannot be found, ultra-pasteurized will work. Whipped cream is generally sweetened with sugar and can also have flavoring added to it for special recipes. The whipped cream can be sweetened with granulated sugar, superfine sugar or powdered sugar. They will all work for sweetening the cream but superfine and powdered sugar will dissolve quicker and prevent the whipped cream from being gritty. Powdered sugar will also help stabilize the whipped cream because it generally contains cornstarch. Add 1 to 2 tablespoons of granulated, superfine or powdered sugar per 1 cup of cream. There are many flavorings that can be added to whipping cream to create a unique taste. Some of the flavorings used are extracts, spices, citrus zest, coffee, liqueur, and chocolate. The chart below shows some flavorings that are used for whipped cream and gives a suggested amount to use. Note: Also add 1 to 2 tablespoons of sugar per cup of cream when adding the flavorings as shown above. The sugar and flavoring should be added just as the cream starts to form a soft peak. Add the sugar and flavoring slowly along the side of the mixing bowl. Continue to whip as the sugar and flavoring are added. Whip cream until it has doubled in volume and forms a stiff peak. If the sugar or flavoring is added before the cream has started to be whip, it will not whip up to its full volume. Also be careful that the cream does not get overwhipped. If the cream is overwhipped it will begin to separate and curdle, and then turn to butter. Whether it is during hot or cold weather the same basic method is used for whipping cream. The important thing to keep in mind is that the working environment should be as cool as possible and the ingredients and the utensils used should be well chilled. The cream should be kept in the coldest part of the refrigerator until just before using. 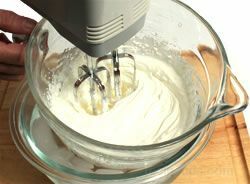 The beaters and mixing bowl, or the wire whisk should be placed in the freezer for at least 15 minutes before whipping the cream. Place the mixing bowl in a larger bowl of ice water to keep the bowl chilled while whipping the cream. HOT WEATHER: Whip in an air-conditioned room. If you do not have air conditioning, whip in the coolest part of your house and be sure to have the mixing bowl sitting in a bowl of ice water. COLD WEATHER: Slightly open a window in the work area, preferably one where the cool air can blow in directly at the bowl containing the cream. Remove the mixing bowl and beaters from the freezer after sufficiently chilled. Be sure to use a bowl big enough to hold the cream once it is whipped. Cream will double in volume. It is also best to use a bowl that is narrow with deep sides. Place the mixing bowl in a larger bowl of ice water. Add 1 cup of heavy cream in the chilled mixing bowl and beat with a hand mixer for 20 to 30 seconds on low until bubbles begin to form. 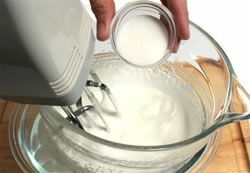 A hand balloon whisk or a stand mixer can also be used to beat the cream. 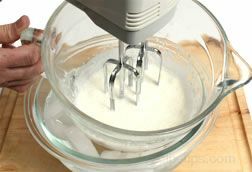 A whisk will take a little longer to get the same results as a hand mixer. 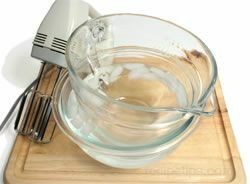 If using a stand mixer, be careful because the cream can become overwhipped quickly because the stand mixer generally is more powerful. 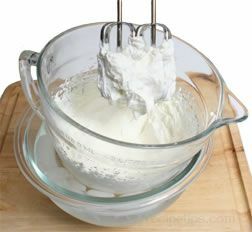 Increase mixer speed to medium and beat until the cream begins to thicken and the beaters show a slight trail in the cream. Increase mixer speed to high and beat until the cream begins to thicken and puff up. Just before it gets to the soft peak stage slowly add 2 tablespoons of sugar and any flavoring desired off to the side of the bowl, continue beating. Be sure to move beaters along the sides and bottom of the bowl while whipping the cream. Continue to beat the cream until it forms a soft or stiff peak. This will depend on how you are going to use the whipped cream. If you are going to fold it into another mixture, only beat the cream to a soft peak. If you are using as a topping, garnish or decoration, beat to a stiff peak. For a soft peak, beat until a soft curved peak forms when pulling the beaters straight up out of the mixture. At this point the whipped cream is still soft enough to fold into the other ingredients easily. For a stiffer peak, continue to beat at high speed for 20 to 30 seconds. To check for stiff peaks, pull the beaters straight up out of the whipped cream. The peak should hold its shape and stick tightly to the beaters. Note: DO NOT overwhip the cream. Once it forms stiff peaks, stop beating. If the cream is overwhipped it will start to separate and curdle. 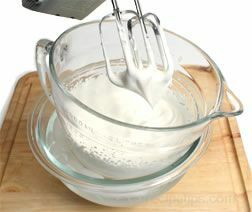 Try to salvage overwhipped cream by adding 1 to 2 tablespoons more of cream and gently whisking them in. Do Not Use mixer to beat in or the same problem will occur. Stabilizing whipped cream gives it a firmer texture and allows it to be used as piping for a decorative border on a cake, prevents it from weeping, and stops it from deflating when mixed with juicy ingredients, such as strawberries and raspberries. Follow instructions below to stabilize whipped cream. Soak 1/2 teaspoon of plain gelatin in 1 tablespoon of cold water for 5 minutes. Place the gelatin and cold water in a heat resistant container and set in a small pan of very hot water just until the gelatin is dissolved. If heating on a stove, do not allow the gelatin to boil. After gelatin has dissolved, set it aside to cool. Allow it to cool to about body temperature. Note: if the gelatin is too hot it will deflate the whipped cream when it is added and if it is allowed to cool too much it will thicken too much and not incorporate into the cream. Follow instructions above for whipping the cream. Add the gelatin after the sugar and flavoring has been whipped in but before the cream forms soft peaks. Once the gelatin is incorporated in the whipped cream, beat until cream forms soft peaks, and then stop beating with the electric mixer. Finish whipping with a wire balloon whisk to bring the cream to the desired consistency. If the whipped cream is to be spread on a cake or dessert, use immediately because it will set quickly and become difficult to spread. Add 2 teaspoons of nonfat dry milk to one cup of cream before whipping. Add 1 teaspoon of light corn syrup to one cup of cream before whipping. Use powdered sugar instead of granulated sugar when sweetening. Powdered sugar generally contains cornstarch which helps stabilize the whipped cream. Incorporate a melted marshmallow into the whipped cream towards the end of whipping. Use a commercial type stabilizer that binds the liquid parts of the cream, helping to stabilize it. One of the types available is Dr. Oetker's Whip It. Cream and whipped cream are dairy product and are perishable so they need to be stored in the refrigerator. Store cream in the coldest part of the refrigerator. Store for up to one week after the date on the carton. Cream can be frozen for longer storage. Be sure there is sufficient room in the carton for expansion and then wrap it in a freezer-safe bag. Freeze for up to 6 months. Thaw in the refrigerator and shake well before using. It is best to prepare whipped cream just before using but if it is necessary to make ahead of time, it can be kept in the refrigerator for up to 48 hours if stored properly. To store, prepare as directed above and then place in a sieve lined with cheesecloth. Place the cheesecloth lined sieve in a bowl that will hold the sieve so it is 2 inches from the bottom. Cover it tightly and refrigerate. If whipped cream is a little stiff when ready to use, whisk in 1 to 2 tablespoons of cream to soften. If there is a small amount of whipped cream leftover, place in an airtight container and refrigerate. Best to use within 24 hours. A good way to use leftover whipped cream is to drop a spoonful on top of a cup of coffee or hot chocolate. Whipped cream can also be frozen for later use. Line a cookie sheet with plastic wrap and then drop serving size mounds on the plastic. Place in the freezer uncovered. When frozen, remove from the plastic, place in a sealable plastic bag, and place back in the freezer. Remove servings as needed. Can be stored in the freezer for up to 2 weeks. Cool Whip: A non-dairy whipped topping that can be substituted in equal amounts for whipped cream. It keeps longer and has fewer calories. It does not need to be whipped. It is ready to use when purchased. It is often frozen when purchase and should be allowed to thaw in the refrigerator. If stirred, it will begin to break down so when used in recipes with other ingredients it should be folded in gently. Foods prepared with cool whip should be stored in the refrigerator. Whipped Toppings in a Can: A type of whipped topping made up of cream, sugar, stabilizers, emulsifiers, and gas in a pressurized can. When released from the can, the gas expands the cream to create a puffy whipped topping. Must be stored in the refrigerator. "My whipped cream is running :( not able to decorate my cake. I tried cold bowls and beaters. I whipped on high speed for 8 'min and it whipped well. I turned my bowl upside down and it didn't fell out. Then I filled it in my decoration piping and kept in fridge. After 2 hours I tried to decorate but it's not holding shape...... please suggest I'm fed up..."
"Great article on whipping cream. I am never sure if I have whipped it long enough and this information explains it pretty well. I also like the tips on stabilizing the whipped cream." "Do you add granulated sugar or powdered sugar when whipping the cream?" "I think you might be confusing whipping cream with beaten egg whites. Egg whites will not whip up if you try to use a plastic mixing bowl and already beaten ones will deflate if stored in a plastic container. Whipping cream does not normally react to plastic like egg whites do." "lots of great info, however, I thought that whipped cream was ONLY supposed to be in a glass or metal bowl, no mention of this is made. that in plastic, even touching plastic wrap may cause separation of the cream to have watery liquid due to the fat molecules bonding with the plastics... Is there any truth to this?"